Victoria is an award-winning Master-level cosplayer with many nicknames (but Tori is never one of them!). She has come a long way since her humble start in 2003, and is best known for her Astharoshe Asran cosplay. Vicky gravitates towards anything that is beautiful, elegant and challenging. As someone who is completely self-taught from the beginning, she views every project as an opportunity to learn new skills, and strongly believes that practice and hard work are integral to realizing one's "dream costumes". 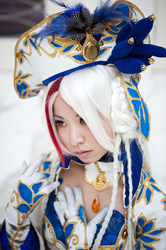 Vicky also believes in giving back to the community and openly offers advice to new cosplayers. You will find the majority of her cosplay.com posts in the General Help section, and she has led panels on dyeing and fabric painting at Anime North. Vickybunnyangel's cosplays have been featured on major websites such as Cosplay.com and deviantART, and in cosplay magazines such as Cosmode and CosplayGen. She resides in Toronto and enjoys playing the flute, dreaming, baking, making charaben, and shopping. Her weaknesses include: bunnies, dark chocolate, cute girly things, and McNuggets with extra sauce.